Prime Minister Robert Muldoon has met his match in the charismatic and eloquent Labour Party leader David Lange. Bob Jones’ New Zealand Party also threatens to split the right wing vote, making a Labour victory all the more likely. Social Credit still exists as a small political force, however leader Bruce Beetham is hoping to build the party’s influence. With the nation in the midst of economic strife, will Muldoon hang on for a fourth term? Or will Lange bring ‘piggy’ down and return Labour to office? Will Jones’ New Zealand Party establish itself as the voice of the Right? Or will Beetham’s message ‘cut through’ to New Zealanders and gain support for Social Credit? Whatever the case, General Election 1984 promises to be one of the most eventful elections that New Zealand has ever had. A series of controversial decisions has culminated in Governor-General John Kerr’s dismissal of Prime Minister Gough Whitlam nad his appointment of Malcolm Fraser, who did not have a lower house majority, in his place. 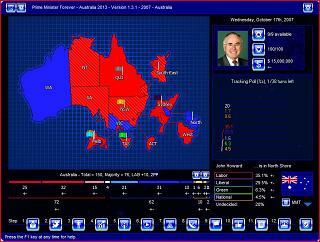 Though Whitlam’s supporters are furious, many voters are more concerned about his turbulent handling of the economy. Playable parties are Liberal, Labor, National Country, Democratic Labor, and Independent – no alternate leaders as of now. I am more than happy to hear feedback and consider further changes! 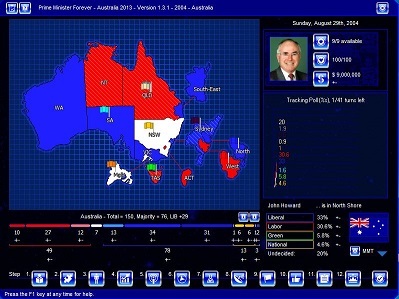 As the year 2004 and the third term of the Howard Government come to a close, an election looms. Many issues of domestic and foreign policy divide a polarised electorate … and, in a post-September 11 world, the spectre of international terrorism is always present. A snap election has been called after an internal coup d’etat against sitting Prime Minister Kevin Rudd. Will new Prime Minister Julia Gillard be able to rehabilitate the Labor Party’s image, or will Leader of the Opposition Tony Abbott and the Coalition be able to focus voters on unpopular Labor policies – and dethrone the new Prime Minister? After more than a decade of the Howard Government, a young and untested Labor leader – Kevin Rudd – has risen on the national scene. Is it time for a change, or will Australians elect John Howard to a fifth consecutive Liberal government?